Canine grooming is an elaborate exercise!! There are many facets of canine grooming and one of the quintessential requisites is cleaning the ears of your dog. Every dog is exposed to a plethora of elements and some of them can find their way into the ear canal. Dogs that love to play in the dirt will have substantial dust and debris buildup in their ears. Even those that do not venture outdoors a lot and resist the temptation to get downright dirty will still be vulnerable to microbial infestation. Bacteria, parasites and fungi may find a safe haven in the auditory panels of dogs. The ear canal may also be invaded by viruses. Hearing impairment is a possibility if a dog suffers from a chronic infection or if it is left untreated for a long time. Excessive moisture, earwax, dust and dirt, debris and growth of microbes will cause inflammation. Dog Ear Cleaners: Why we need to use them! Dog ear cleaners are necessary to prevent two serious problems: infections and hearing impairment. If you do not routinely clean the ears of your canine friend, the gradual buildup of various matters will increase the likelihood of an infection. It should be noted that foreign matter can cause an infection immediately or a buildup of various substances will eventually cause an ear infection. Even moisture can cause ear infection. Slow buildup of moisture in the ears will make the moist ear canal a haven for various types of microbes. These will consequently cause infections and inflammations. An ear infection is not incurable but it can become a serious ailment. Preventing ear infections is better than looking for remedies that will take weeks, if not months, to cure the problem. The ear canal will suffer an inflammation. The dog will initially fidget, shake its head and try to scratch its ear due to the discomfort caused. There will be an effect on the auditory function in due course of time. Loss of hearing or hearing impairment does not happen overnight. it is super important to be proactive or at least active than reacting to a condition that has already become a health problem. Luckily just a routine ear cleaning exercise will prevent inflammations, infections and hearing impairment – here we have highlighted our favourite products with recommendations and highlights for each. See our handy comparison table here or scroll further down for fuller indepth reviews of each or jump to the end to see our Buyers Guide! VetWell Cat & Dog Ear Cleaner is veterinarian formulated. It can help to clean and deodorize your pet’s ears. It includes a safe and gentle formula w/ the Aloe Vera plant. This product helps to end the buildup of dirt, debris, wax, and fluid in the ears. That, in turn, helps to prevent itching, scratching, and irritation. 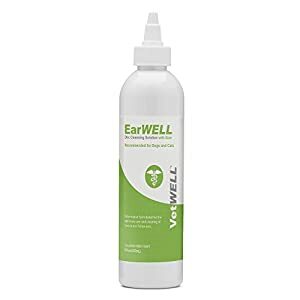 You can use this product for treating ear infections caused by factors like yeast and mites. You can use it daily on your pet’s ears. You won’t have to worry about stinging, burning, or aggravated ear canals. This product is made in the USA in government-regulated facilities. This helps to provide high-end quality/safety. Lillian Ruff Ear Cleaner is designed to clean ears of dirt and wax. This is important because dogs’ good sense of hearing is mostly due to having a deep ear canal. The ear cleaner contains aloe and lavender/coconut scent. In fact, the product’s scent is one of the fortes. It also helps to reduce ear odors with bee propolis and tea tree oil. 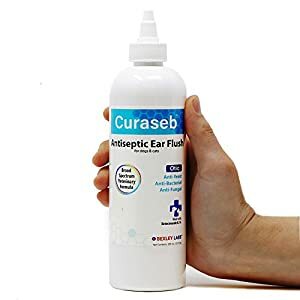 This ear cleaner is safe for sensitive ears. So if your dog has that condition, this is an effective product to consider using. 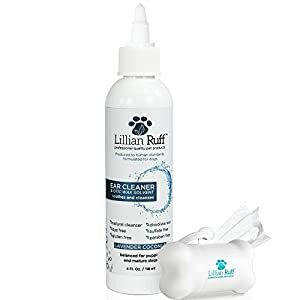 Lillian Ruff is a quality ear-cleaning solution that helps to keep your pooch’s ears clean while minimizing infections. 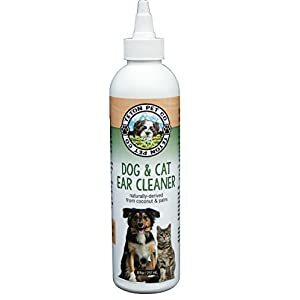 Ear Cleaner for Dogs also includes a 30-day money-back guarantee. 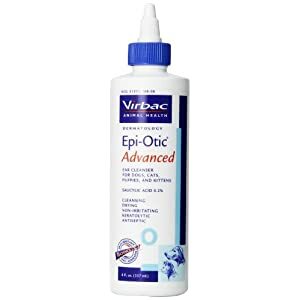 Virbac’s Epi-Otic ear cleaner is designed to be used for routine cleaning of a dog’s ear canal. You can also use it before using other ear treatments. It’s a cleansing/drying solution that’s alcohol-free. Epi-Otic has a pH level of 2.2 and doesn’t contain any alcohol. This makes it gentle on ears and especially for sensitive ears. The product is in the under$-20 price range so you can get a quality ear cleaner without spending a small fortune. This will free up money for other pet-related stuff. As always it’s important to use the product as directed to get the best results when treating your doggie’s ears. This is an effective and safe/non-toxic method for cleaning your dog’s dirty ears. It’s safe because it doesn’t contain any harsh cleaners/chemicals. This helps to prevent various issues. 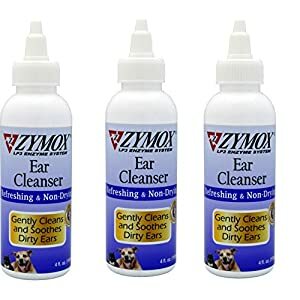 The Zymox Ear Cleaner is available in a 4-ounce bottle that’s easy to use. This makes it easier to clean your dog’s ears. Zymox Ear Cleanser also helps to prevent ear problems like infections. You can use this product to experience the Zymox 3-point enzyme system. It contains the following ingredients: Lactoperoxidase, Lactoferrin, and Lysozyme. The combination of these ingredients produces the best results. It produces a powerful ear cleaner for ear maintenance and prevention of issues like wax buildup. You can use it with Zymox Otic Enzymatic Solution. The ear cleaner helps to keep your pooch’s ears smelling fresh. So they’ll smell as good as they look after cleaning. Bexley Labs’ Curaseb Ear Infection Treatment can treat most ear infections caused by bacteria, fungus, and yeast. The formula is designed to knock out these causes of ear problems. The product can help to get rid of gunky/smelly ears. The in-house formula is veterinary-grade ear flush that battles tough ear infections. The product cleans/flushes ears gently. TI’s water-based and aloe-infused. It’s still effective to flush out debris like wax from the ears. It also leaves a fresh scent of cucumber melon. The manufacturer also offers a money-back guarantee, so your purchase is risk-free. This is a topical solution that can be used on your pet’s skin since it’s alcohol. Curaseb can help to treat various skin issues like acne, scales, and rashes. 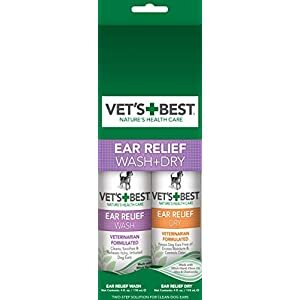 Vet’s Best Dog Ear Cleaner Kit provides a whole set for washing/drying ears. It helps to treat dog ears that are itchy/raw/smelly. This helps to keep the ears fresh/dry in between each bath. The product is fast/effective. It provides fast relief for ears that are itchy, irritated, and greasy. The results are also lasting so you won’t have to keep applying it frequently. The Ear Cleaner Kit is made of natural ingredients including tea tree oil, clove oil, and aloe vera. This is especially helpful for dogs with sensitive skin since it will reduce the chance of irritation. It’s also non-stinging and alcohol-free. The Ear Cleaner Kit is made in the USA. 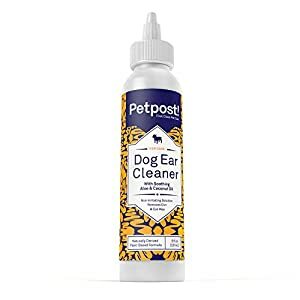 Petpost Ear Cleaner is effective at cleaning ears of dirt/wax that can help to deal with parasites like mites. This, in turn, will help to make your pet pooch cleaner and happier. This Ear Cleaner is easy to apply and doesn’t cause any mess. This makes it a cinch to keep your ears clean. You won’t have to worry about things like spilled solutions and measuring capfuls. 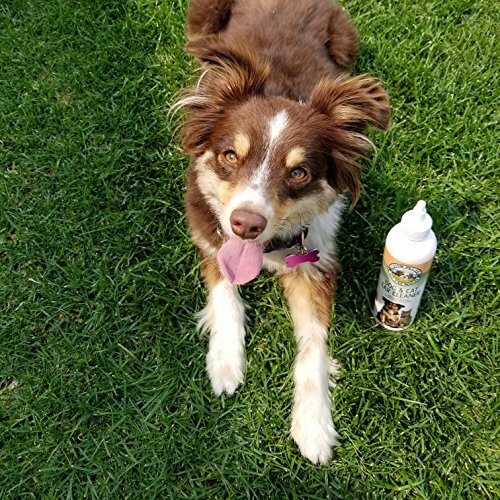 Veterinarians and groomers recommend this product over other treatments that have strong chemicals like pesticides or prescription meds. These are more likely to cause unwanted side-effects. Petpost offers a 100% satisfaction guarantee. If you or your dog isn’t happy with the Ear Cleaner, you can get a full refund. There are no questions asked. Easy-application nozzle for getting to ears easier and eliminates spilled solution, measuring capfuls, etc. This Ear Treatment Cleanser is from Mister Ben’s. The product is designed to produce results within a couple treatments. That includes stopping itching/scratching/head shaking. This Ear Treatment Cleanser includes 6 active ingredients that team up to treat/protect dog ears vs. the root causes of ear issues. That includes bacteria, fungus, mites, and yeast. This product is effective for all dog breeds including big and small dogs. The product delivers nearly immediate relief from infection, swelling, inflammation, irritations, and redness. It’s effective for treating ear infections in dogs. You can find this product on Amazon. 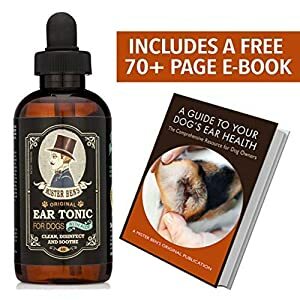 It’s also bundled with a free eBook about Dog Ear Health. Each Mister Ben’s product sold also includes a donation to New York’s Last Chance Animal Rescue. Provides relief from redness, irritations, inflammation, infections, etc. Teton Pet Ear Cleaner is a natural ear cleaner that will help to keep your mutt’s ears super-clean. In fact, it will be as clear as Teton Mountain air in the Rocky Mountains. This product helps to clean, dry, disinfect, deodorize, and acidify the ears of dogs/cats. It’s also effective in removing debris from the ears like dirt and wax. The product also helps to soothe small skin irritations. It also removes inorganic chemicals and minerals. The Ear Cleaner does that without using any phosphates, sulfates, and parabens. This helps to reduce the chance of side-effects like skin irritations. You’ll want to avoid such situations when trying to improve the health of man’s best friend. Prioritize the ingredients in dog ear cleaners, check the primary ingredient and the additional constituents. Most dog ear cleaners will have specific objectives. Some may be great at curing infections and many are good for regular cleaning. Check the exact formulation and the recommended application. You can choose dog ear cleaners that come with infused scents. Some dogs like the fragrance but do not compromise on the formulation or the composition in the process. Some dog ear cleaners can be greasy and might become an irritant for your pet. Some cleaners contain alcohol and not all are equally gentle. You should compare these attributes of dog ear cleaners to find the best one. What are Dog Ear Cleaners? Dog ear cleaners are a solution, usually available in two forms, which can cleanse the inner and outer structures of the ears. Dog ear cleaners typically contain antiseptics and disinfectants. They can neutralize microbes and also get rid of debris. Any kind of unnatural buildup, be it of moisture or residues of soap, shampoo or medicines, dust and dirt along with pollens, grass and mites can be gotten rid of from the ear canals. There are two types of dog ear cleaners: drops and wipes. Ear drops are similar to eye drops. Administering them is also similar but there is an additional component of massaging the ears of the dogs to help spread the drops evenly within the ear canal. Ear wipes are similar to wet wipes that are used by humans to clean hands and face. These wet wipes are more suited to clear the external structure of the ears. You should not use ear wipes deep inside the ear canal. The wipes do not pose any threat but the physical intrusion or the invasive approach can cause damage to the inner structures of the ear. Ear drops are suitable for more serious problems. They are also necessary to treat infections and allergic reactions inside the ear canals. Ear wipes are more suited to cleanse the external structures of the ear. Dogs do not like being poked in their ears so using wipes to reach into the auditory canal is not an easy task. It may be impossible with some breeds of dogs. Choose liquid drops for internal applications. Choose moist wipes for external applications. Many conditions demand the use of both drops and wipes. You may need to use the drops to cure internal infections. Then the wipes may be used to clean the external surface of the ears. You should begin by cleaning the outside with the wipes and then apply the drops, massage the base of the ear to help the drops get evenly spread in the ear canal and again use the wipes to clean out the reachable parts of the ears to finish the process. There is no problem in using both drops and wipes, as long as you are choosing a medicinal grade product and not a cosmetic version from an unknown brand. Dogs are vulnerable to ear infections, allergies and physical damage to the inner structures including the ear canal and the eardrum. There can be excessive moisture after bathing, swimming or grooming. You may exert excessive pressure or use unsuitable materials to clean the ears and this can cause damage to the ear canal. There are environmental factors as well such as weeds, pollens, grasses and other types of plant debris. Dust mites and molds also pose a risk. Dogs can have allergies in their ears. There are usually two types of allergies they are vulnerable to. One is airborne. Some dogs have drooping auditory panels and these do protect the inner ear structures but they are still not completely sealed and hence shielded from foreign objects. Airborne allergens can get into the ear canal, rest there and contribute to a buildup. These airborne particles can cause an infection. They may also worsen an existing infection. There is also a cumulative effect. The airborne allergens can worsen microbial growth. If a dog already has excessive moisture or earwax then there can be other complications too. Allergies may be seasonal or perennial. Usually, dogs are more vulnerable to airborne allergies during the warmer months. Grass and pollen are two common allergens for dogs. Residual traces of soap and other products can also cause problems in the ears. This is why vets recommend preventing soap water or shampoo from getting into the ear canals while bathing dogs. The other type of allergen is food. Dogs could be allergic to certain foods. If a particular food is causing an ear infection or allergy, then it is imperative to exclude that from their diet. The sooner you exclude the food from their diet, the easier it will be to treat the allergy. Common food allergies are caused by eggs, dairy, chicken and beef. It is best to consult a vet if you are uncertain which food is causing the allergy. Some dogs will be allergic to foods they have not tried before. If you intend to change their diet, consult a vet just to be safe. Such allergic tendency also depends on the specific breed. The ears of your dog may become thriving grounds for bacteria, fungi or yeast and mites. Bacterial infections are quite common. They usually affect the skin but also the ear canals. The most common type of bacteria is staph strains. This kind of bacterial infection is not contagious. The infection will not spread from your dog to your loved ones. However, the infection should be cured sooner than later. Antibiotics may help. There are non-antibiotic cures as well. The ideal remedy is of course the best dog ear cleaners so there is no infection in the first place. Some infections may become chronic so being proactive with canine grooming is always more desirable. Yeast infections are quite common in dogs. The initial reaction is an allergy. Then there is an excessive secretion of oil in the ears and through the skin. The excess oil makes it easier for the yeast to thrive. The fungi begin to multiply rapidly. This worsens the problem. Yeast infections are curable. You can use antifungal medication but it is healthier to just prevent the infection. The same rationale applies to mites. Dogs are more resistant to mites infestation but not immune. Microscopic insects called mites may not cause much physical damage to the ear canals but they can be a menace for small animals. Your dog may behave crazily if there are too many mites in their ears. Anti-parasitic remedies are available. You may consult a vet as well. It is likely your vet will recommend one of the best dog ear cleaners as an solution. Foreign objects are not the most common problem for your dog’s ears. Large foreign objects are a nonstarter but small materials such as plant debris, flies and other living or nonliving matter may find its way into the ear canals. Even dried medication for dog ears can be a concern. Cleaning the ears of your dog has to be a ritual. You may choose to clean their ears once a week. You can do so once a fortnight or every thirty days. Dogs that have clean and healthy ears do not require a daily cleansing. Those who have an infection will require daily cleaning. Most dogs will do great with a weekly or fortnightly ear cleaning routine. So thats our list of our recommended dog ear cleaners – let us know if you have tried any and what you thought, or if we have missed one of your favourites! !